Built in 1890 by McDonald* Dunwoody, this iconic Folk Victorian home was sold in 1905 to Charles M. Tyson, a prominent timber broker and president of the Darien Bank. It was owned by the Tyson family for many years and was later acquired by the Deans. It’s one of the finest houses extant in The Ridge. *-One source identifies Mr. Dunwoody as McDonald while another lists him as Walter. William Henry Patterson came to Darien after the Civil War and purchased the land on which he built this house from the Blount family. 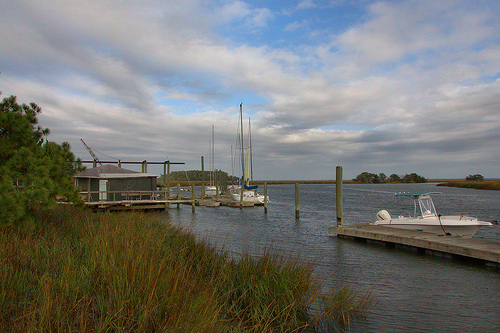 The neighborhood on the Old Shell Road (Georgia Highway 99), known as The Ridge, was an exclusive retreat for river pilots and timber brokers who worked in Darien, three miles to the south. Captain Patterson was a successful bar pilot who guided timber in and out of Darien. 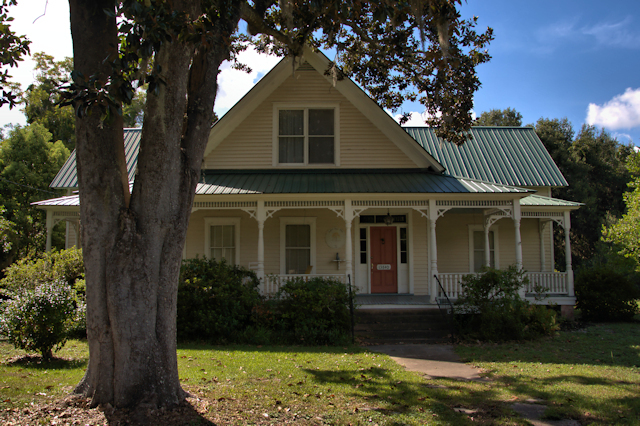 The house was originally a Georgian cottage with a central hallway, two rooms deep, and featured a detached kitchen and shed veranda porch. 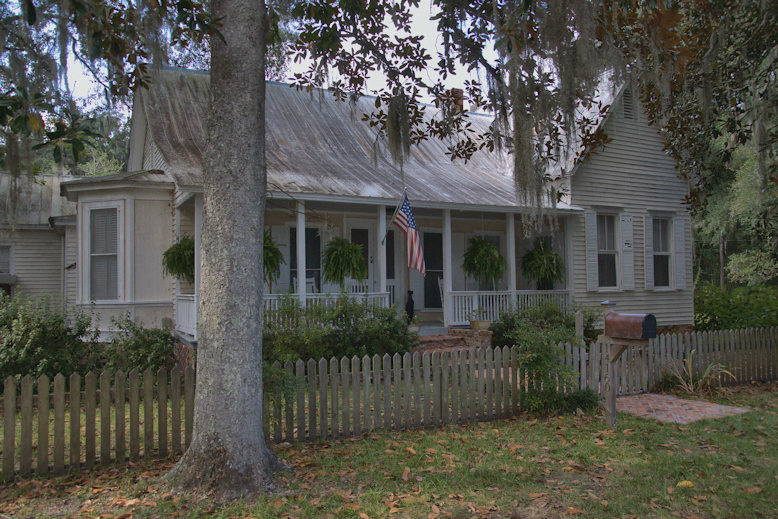 Captain Patterson lived here for just two years before building a more formal house across the street. The Redding family later owned the home and “modernized” it in 1938, adding the bay windows, an attached kitchen, front and rear foyers within the central hallway, and hardwood flooring over the heart pine. Hannah deSoto Brown and Andy Tostensen purchased it in 1973 and restored many of the original features, including the hallway, high ceilings, and rough plaster walls. It’s a very welcoming space and I’m grateful to Hannah for sharing the history. 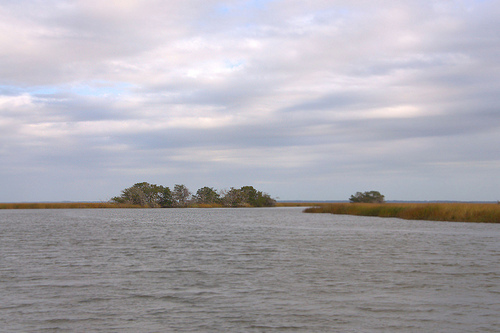 James Cromley, who was the keeper of the Sapelo Island lighthouse between 1873-1889, and the first of several Cromleys to hold that position, built this home in the mid-1870s. It is also known as the Cromley-Waters-Brandt House, for later owners. Thanks to Missy Brandt Wilson for the historical background. 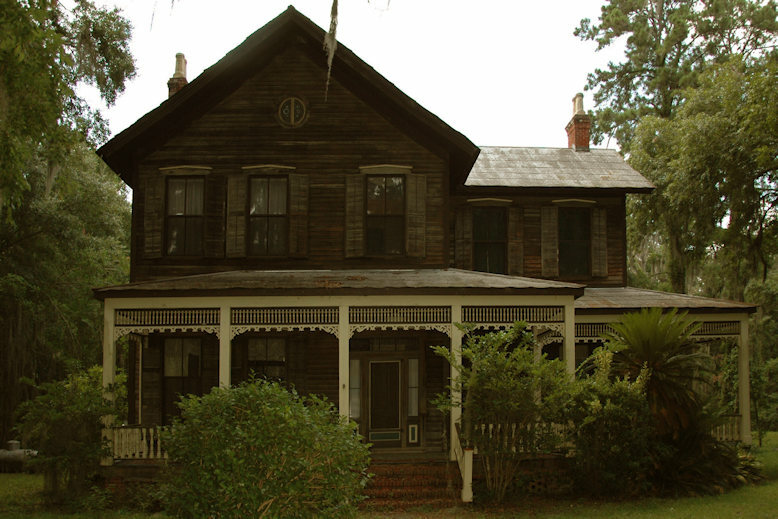 William H Davis writes: This is the Thompson family home. My great-great grandmother bought the lot behind this house from the Thompsons in the 1880s. The home is still in her estate but is abandoned. I spent many happy summers there on The Ridge. 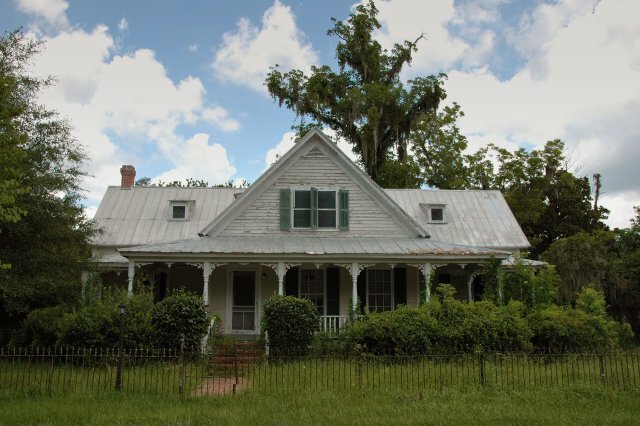 The present owner, Virginia Hames Troy, is restoring the house. 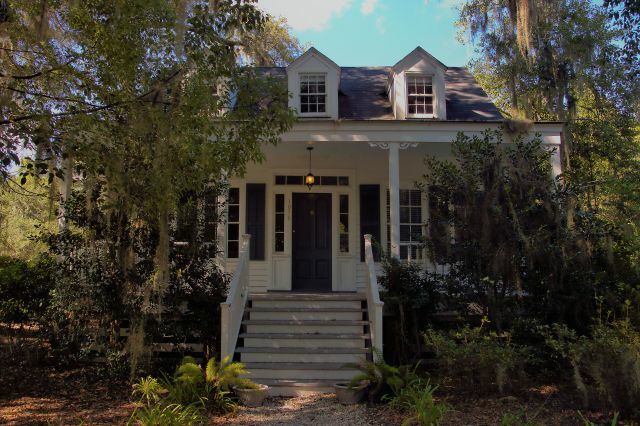 She writes: The first owner of our 1870 house, Moses H. Thompson, sold an adjoining lot to Mr. Davis’ great-great-grandmother (a friend of Mrs. Thompson’s) and also a few acres further back to James Cromley, who was Sapelo Island’s lighthouse keeper from 1873 -1889. Moses Thompson was a manager for Hilton Lumber Company’s sawmill on Union Island which was located near the site of Blue N Hall Marina. There are interesting stories about Thompson and 19 other men who were captured by Union soldiers while trying to run a Union blockade of Doboy Sound. Most were taken to a prison in Philadelphia and had to walk home to Georgia at the end of the Civil War. 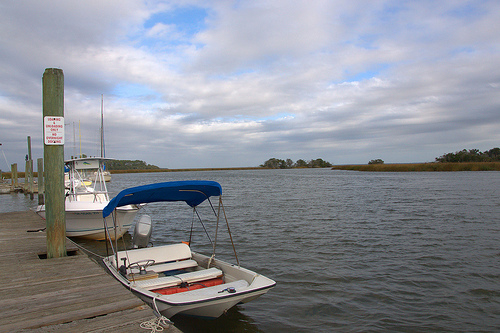 One of numerous tidal rivers and creeks to be found in McIntosh County, the North River is accessible at Blue-n-Hall Road. 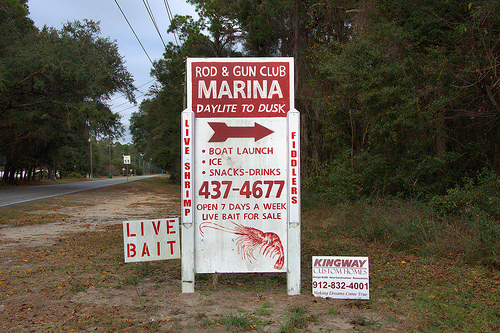 There’s a boat ramp here, as well as the Rod & Gun Club Marina.